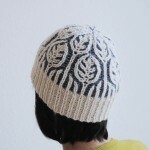 I made Video Tutorials for my two color brioche stitch hat pattern, Frost on Leaves. I try to explain, what is Brioche Stitch. You knit this hat in round. Imagine that you knit k1p1 rib in round. Round 1: You knit only knitted sts in round. You do not purl purled sts but just slip them. Round 2: You purl only purled sts in round. You do not knit knitted sts but just slip them. There is a small trick for each slipped stitch. If you slip a stitch, you make YO with your working yarn. A slipped stitch & YO is always together. Combination of sl&yo is a distinction of Brioche Stitch. I say once more. A slipped stitch & YO is always together. In my pattern, I wrote which is first, but actually you make a slipped st and YO at the same time. You slip a stitch during making YO. Or you make YO during slipping a stitch. Both has same effect. In the next round, you knit / purl a combination of sl&yo together. Now you know how to knit Round 1&2 exactly. Here is video tutorial of Round 1. Frost on Leaves has two colors. So you change MC and CC in every round. For making leaf pattern, there are several increase sts and decrease sts. I made also video tutorial of increase sts and decrease sts. This entry was posted in Uncategorized @en on January 5, 2014 by midorihirose.